To celebrate the "Aphrodite the Beauty" Swag Bag Contest, here is my review of the second book in the Goddess Girls series!! Don't forget to enter the contest! My review:I really loved this installment of the series. I think it deals with a really important tween issue for girls-standing up for yourself. This is an age where girls really start to feel pressure to be like everyone else and it's hard to remember to speak up. Persephone is always agreeable, she wants to go along with everything just so she won't make anyone mad. She drags along to the mall when she would rather be home. She always agrees with her group of friends, even when she thinks differently. She even buys things she doesn't want in order to fit in and please others. 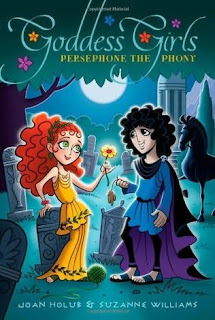 For this reason, Persephone feels like a phony. When she gets to know "bad boy" Hades, Persephone knows her friends and her mother don't approve. But for the first time, she wants to do what she wants, not what everyone else wants her to do. Persephone finds herself in danger by ignoring too many rules and she finally realizes there needs to be a balance between always agreeing and being too wild. I think this age is when girls start submitting to peer pressure and start to lose themselves. This book could really be a helpful tool in teaching girls that they can still speak up for themselves and be an individual. Speaking up seems to be praised in boys but not girls, so I'm glad to see it addressed in a book targeted to girls. I can identify with Persephone even now and I hope I can learn to try to be less of a people-pleaser like she did. 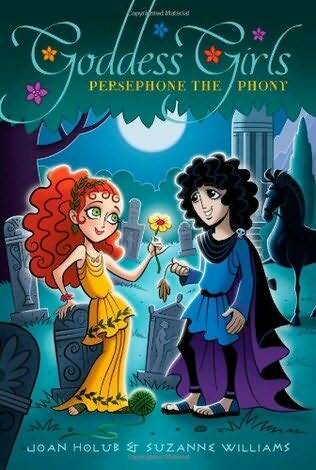 Hades and Persephone's romance was just too adorable, and I enjoyed seeing their relationship continue to blossom in the third book. Bottom Line:Persephone's story was another great addition to the Goddess Girls series, with fantastic elements of young love, friendship, family, and most of all learning about yourself. Want to read this series so much! And you reviews your tempt me more! Hmmm ... I've not heard of this one but it sounds like something I'd enjoy reading. Thanks for sharing. I really love the idea of these books. Great review! I've always had an interest in Hades. He seems like such a bad boy, but this storyline reveals his inner goodness, which makes him worthy of Persephone's friendship. Suzanne and I tried to be realistic with the themes and situations so that they ring true to tweens, while still entertaining ourselves as writers as well as Goddess Girls' readers! Thank you so much for your reviews of this series. They have been so enjoyable, Carrie! We really appreciate being included on your fabulous blog. Thanks for stopping by, Joan! Hades is one bad boy that I really like!! Because like you said, he's really good at heart. You and Suzanne did a fantastic job with the myths! Hopefully young readers will be interested in learning more about them! Thanks, Carrie. We really hope the books will inspire young readers to learn more about mythology too. And maybe, having read the stories, our readers will also find their interest in Greco-Roman artifacts and sculpture heightened when they visit museums!